There was a period of time when Adult Swim lost its luster for me. There were too many live action shows. Half the time I’d turn it on and there was just a rerun of Family Guy. The cable channel that had given Aqua Teen Hunger Force, Space Ghost Coast to Coast, Moral Orel, Robot Chicken and Squidbillies was kinda lacking. And then Rick Sanchez arrived. He was a mad scientist, an intergalactic explorer, a multi-dimensional legend and a lover with a liver that could handle any toxic substance or party pill tossed down his mouth. Most importantly he was a grandfather to little Morty Smith. Very quickly this became the greatest cartoon on TV since The Simpsons with it’s bizarre pop culture references and outlandish story lines. Rick and Morty was something that could dazzle the eye and make your stomach a little queasy. Rick and Morty: The Complete Seasons 1-3 gathers together the first 31 episodes that turned Spencers into a Pickle Rick Emporium. “The Pilot” opens with a drunk Rick (Justin Roiland) waking up Morty (Justin Roiland) and putting him on his just made flying saucer. Morty doesn’t seem that amazed. He’s not even nervous when Rick talks about dropping a bomb. He freaks out when Rick declares that they need to get Jessica, Morty’s crush so that they can repopulate humanity. He doesn’t think Jessica knows he exists. Things get complicated on the adventure and by the time the duo return back, Morty has missed an entire semester of school. His parents aren’t happy about this vanishing act. This is the bizarre joy of this bizarre show. Rick overwhelms his normal family with his outlandish devices, discoveries and futuristic associates. He’s not happy that his daughter Summer (Greek‘s Spencer Grammer) has married a schlub that is Jerry (Saturday Night Live‘s Chris Parnell). As much as he drags his grandson Morty on ill-fated adventures, he initially leaves behind his granddaughter Beth (Scrubs‘ Sarah Chalke). The show enjoy spoofing favorite science fiction movies and shows such as Back to the Future, The Fantastic Voyage, Lawnmower Man and the cinema of David Cronenberg. During a spoof of Inception, the duo sneak into the dreams of the math teacher only to get chased by a Freddy Kruger character called Scary Terry. The second season picks up with the cliffhanger on “A Rickle in Time.” Things go weird with the timelines between the characters. “Get Schwifty” has the Earth’s fate placed in a version of the Eurovision singing competition. It’s up to Rick, Morty and Ice-T to bust out a song that won’t get the planet destroyed. This is the one your kids will start singing at Easter service to horrify your grandparents. The final episode “The Wedding Squanchers” featured the massive cliffhanger of Rick getting nabbed by the Federation for his crimes. Can he escape? The third season can get summarized by two things: McDonald’s Szechuan sauce for McNuggets and Pickle Rick! “The Rickshank Rickdemption” has the Federation trying their best to get Rick to crack. He makes it so that the secret to all his work is in the packets of Szechuan that McDonald’s only produced back in the ’90s when Mulan was released. This was truly the moment when the power of the show was felt as McDonald’s brought back the sauce for a limited time and fanatics lined up for the rare tasty joy. The third episode “Pickle Rick” has Rick turn himself into a pickle. While this might seem like a throwaway goofy idea, Pickle Rick spawned hundreds of products from t-shirts to magnets to a real pickle in a Pickle Rick wrapper. That’s not to say the third season was a cash in. There were a lot of great episodes including the Smith family fearing they are merely clones of their former selves which they might be. This is science fiction that demands you look up the theories on Wikipedia. 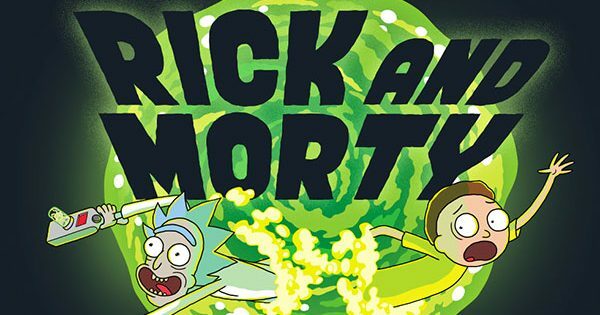 Rick and Morty: The Complete Seasons 1-3 is essential viewing for fans of animated weirdness. Having all the episodes that have been produced so far (Adult Swim promised 70 more episodes over the next few years) make is so easy to hit Play All and just get sucked into a Rick Vortex that keeps you pinned to the sofa all day. The boxset comes in both DVD and Blu-ray. The video is 1.78:1 anamorphic. The transfer brings out all the weirdness of Cronenberg creations and wormholes. The audio is Dolby Digital 5.1 Surround. This mix works best when it’s science fiction weirdness taking over your ears. The episodes are subtitled. Commentary Tracks are provided on the episodes with the cast and crew and crew that’s also cast. Animatics are provided for most of the episodes. You get to see the show in the rawest form. Behind the Scenes (19:07) takes us into the studio to see how Justin Roiland creates the magic from the recording booth to the computers. It’s all here to show that this series takes a lot of people to create the weirdness. Deleted Scenes Animatics are scenes that didn’t make it to the final stages. Morty makes a dinosaur in the lab. There’s a fingerprinting joke. Rick and Morty Season 2 Premiere Party Featuring Chaos Chaos (43:11) is from Cinespace. The band plays in front of sketches from the new season. The crowd won’t shut up and enjoy the music. At least Justin seems to enjoy them. Inside the Episode breaks down the plots of the season 3 episodes with cast and crew on camera telling what was going on. It’s kinda like the post HBO bits for Game of Thrones. Inside the Recording Booth (6:12) has Chris Parnell in the booth doing his lines in various tones. And then things get weird with Justin. Rick and Morty Origins: Part 1 (4:53) and Part 2 (4:36)starts with how Justin and his pals were creating ads for video store. Dan Harmon and Justin hooked up via a Channel 101 video night at a So Cal club night. Justin did a spoof of Back to the Future that evolved into his pitch for Rick and Morty. Dan Harmon claims they auditioned a billion people to voice Morty, but did they call you to go in the booth? Adult Swim & Warner Home Video presents Rick and Morty: The Complete Series. Created by Justin Roiland & Dan Harmon. Starring: Justin Roiland, Chris Parnell, Spencer Grammer and Sarah Chalke. Boxset Contents: 31 episodes on 6 DVDs. Released: February 5, 2019.